Cleaning the bathroom can be a nasty job, and other than the kitchen, it can take the most amount of work and time because of all the different kinds of surfaces you have to tackle. While you can find somewhat inexpensive commercial cleaners that are strong enough to tackle any job, making a homemade bathroom cleaner is better for the environment and safer for your family. 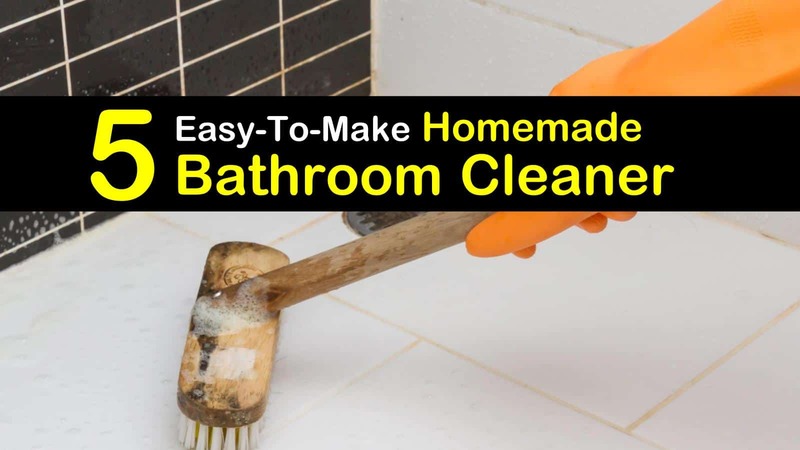 Using simple ingredients that are readily available, you can create several different homemade bathroom cleaners to tackle the dirt and grime in your bathroom, from homemade grout cleaners to homemade toilet bowl cleaners, there’s a recipe for it all. The following recipes will perform just as well if not better than the commercial cleaners you can purchase at the store. Here are the best homemade cleaners for every surface in your bathroom. Avoiding the harsh chemicals that are often found in the commercial cleaners has never been easier. Making your own bathroom cleaner is extremely easy and will cost you a fraction of what the popular store-bought cleaners cost. With most ingredients already in your kitchen, you can deep clean your bathroom without leaving a toxic residue. What could be better than a bathroom cleaner that is environmentally friendly and safe for your family? The ingredients in this recipe bring a new definition to the words clean bathroom. 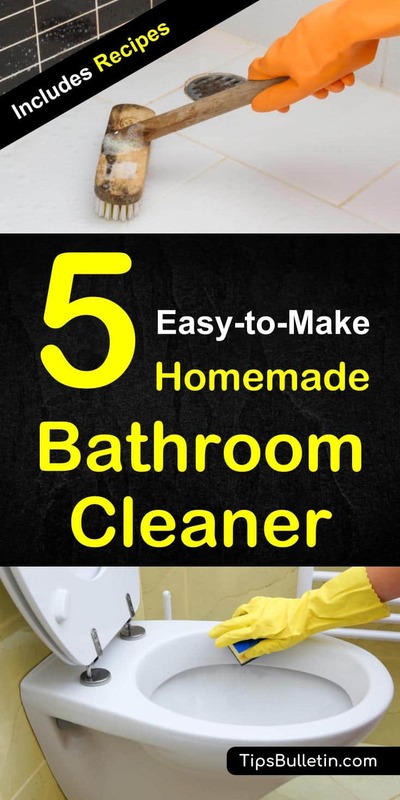 It uses simple ingredients that are relatively cheap and easy to find, and they work hard to clean away the dirt and smells often associated with bathrooms. Fill the spray bottle with warm water. Add the baking soda to the bottle and shake well to combine. Add the essential oils and castile soap. Gently shake the container to ensure the ingredients are mixed. You can use the recipe to clean everything from the bathtub to the toilet. Spray the area and allow the solution to sit. Then wipe clean with a damp cloth. To remove rust spots in your bathtub or toilet, make sure you check out our detailed tips on how to remove rust stains from bathtub and toilet. It includes multiple natural recipes for rust removal in porcelain and fiberglass tubs. When it comes to cleaning the shower, cutting through the soap scum can be difficult. The ingredients in this easy-to-make homemade shower cleaner are very similar to our homemade window cleaner and can quickly get rid of soap scum and uses everyday ingredients you can find in your kitchen. Combine the vinegar and dish soap and pour it into the bottle. Shake well to combine. Add in the essential oils, once again shaking to mix. Spray the tile and tub with a generous amount of the mixture. Let it sit for 10 minutes. With a clean rag wipe the solution away. For best results use daily. You may think that to get your toilet bowl clean; you have to use expensive, chemical-laden commercial cleaners, or overly complicated DIY cleaners. This homemade toilet bowl cleaner uses three ingredients that you can find in your pantry, making it inexpensive and easy to make. Put the baking soda in a glass bowl. Add the essential oil and with a wooden spoon, blend the oil into the baking soda. After you’ve broken up the oil clumps, place the blend into a glass jar and store until you’re ready to use. To clean your toilet place one tablespoon of the cleaning mixture into the toilet bowl. Using a toilet bowl brush, thoroughly scrub the bowl. Add eight tablespoons of 20-percent white vinegar. The mixture will begin to fizz. Take your cleaning brush and give the bowl an extra scrub. This toilet bowl cleaner is also very effective to get rid of any sewer smell. Use it directly in your shower drains and bathroom sinks. For more serious drain cleaning make sure you check out one of our natural drain cleaner recipes here. To unclog a drain, your shower or the toilet make sure you read how to unclog a shower drain here. The grout in your bathroom can quickly become stained and nasty looking, no matter how much you clean it. To help get your grout sparkling clean and looking like new again, here’s a homemade grout cleaner that is inexpensive to make and easy to use. Combine the ingredients in a medium-sized glass bowl. Stir the mixture until a thick paste is formed. Apply the paste to your grout, and using an old toothbrush, scrub the paste into the grout. Rinse with warm water and wipe up any standing water with a clean, dry towel. If you have a buildup of soap scum on your bathroom tiles, or even worse mold or mildew, the hydrogen peroxide in this recipe will efficiently tackle these problems. It is a safe and environmentally friendly alternative to commercial cleaners and cost less than store-bought cleaners. To get more natural DIY recipes for floor cleaning solutions, check out our homemade tile floor cleaner recipe. In a glass bowl, combine the baking soda and hydrogen peroxide. Stir until a thick paste is formed. Apply the paste to the bathroom tiles with a damp sponge. Leave the mixture on for at least 30 minutes. Using an old toothbrush, scrub the paste to remove the soap scum. Rinse with warm water. Mix the hydrogen peroxide and water in a glass spray bottle. Liberally spray the solution over the affected area. Allow it to soak without rinsing. After thirty minutes, if the mold is still evident, spray the mold with straight hydrogen peroxide. Let sit for ten minutes then scrub with a nylon scrub pad. Wipe clean with a damp sponge. Pour the hydrogen peroxide directly over the mildew to remove it. Allow the peroxide to sit for thirty minutes, then wipe with a damp sponge. The next time you are preparing to clean your bathroom, consider whipping one of these recipes up as an alternative to commercial cleaners. Not only are these inexpensive to make using ingredients you probably already have in your home, but they are safer for your family and more environmentally friendly. Don’t continue to clean with harsh chemicals that could be toxic to your family, use these homemade bathroom cleaners instead. We hope the information we’ve provided you in this article is helpful. Please share with everyone you might think could benefit from this information.